While I love makeup I am no beauty guru or makeup expert. I know the basics and have my die hard, favorite products and that's pretty much it. Even though I don't have a giant makeup collection I still wanted to showcase what makeup I did have. Like pretty much every fashion/lifestyle/beauty blogger I love acrylic. I love the simplicity and elegance it has. It goes with every type of decor and just adds such a clean, modern touch. 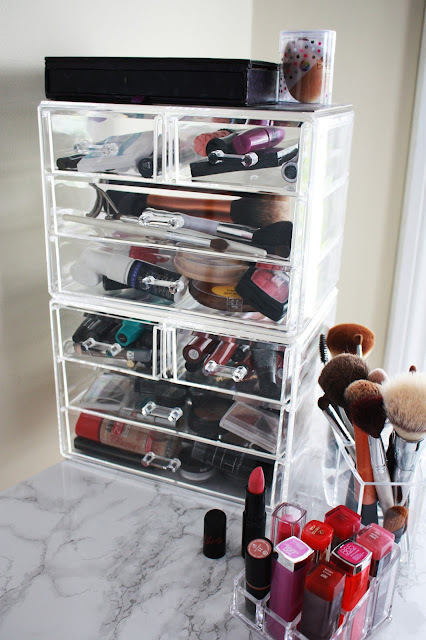 I have been looking for acrylic drawers to house my makeup for a looong time. I kept seeing them on Instagram and various blogs and loved the way the makeup looked. But I couldn't justify spending hundreds of dollars on essentially plastic boxes. Even the cheaper ones I did find were $100. Still way out of my budget. One day my dad and I were at At Home, a new home goods/ organizational/ decor store that opened up near us and we were perusing the aisles. I saw acrylic organizational stuff and made a beeline for it. Low and behold there were acrylic drawers for, wait for it... $25 each! PRAISE JESUS HALLELUJAH! I grabbed two and walked to the checkout so fast. I was so giddy with excitement that I had finally found my precious acrylic makeup drawers. 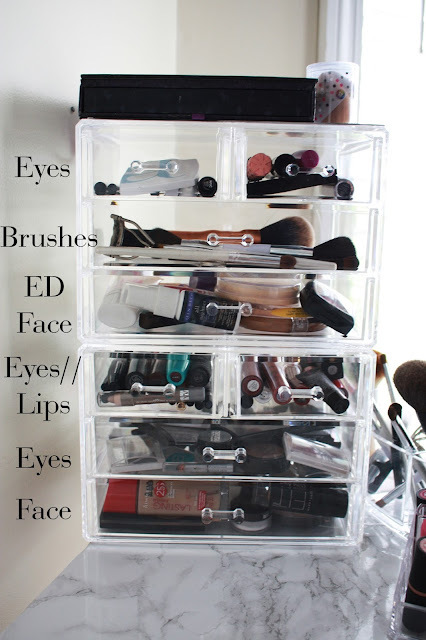 I absolutely love the way the makeup looks and generally my whole makeup storage set up. 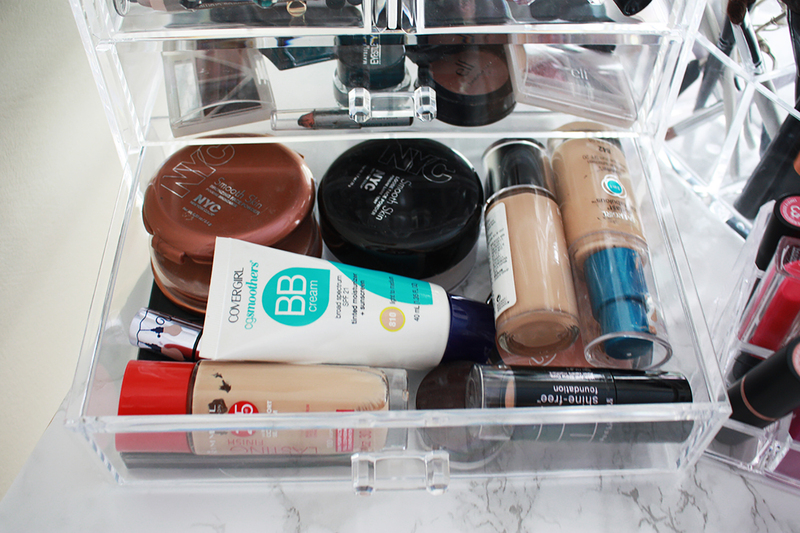 So today I'm going to be showing you the drawers and how I organize my makeup! There are two large drawers, and two smaller drawers per unit. The entire unit is 9.45" W x 6.69" D x 6.89" H. The two smaller drawers are the same depth as the larger ones just half the size. They stack right on top of each other and sort of 'click' in so they don't slide around. 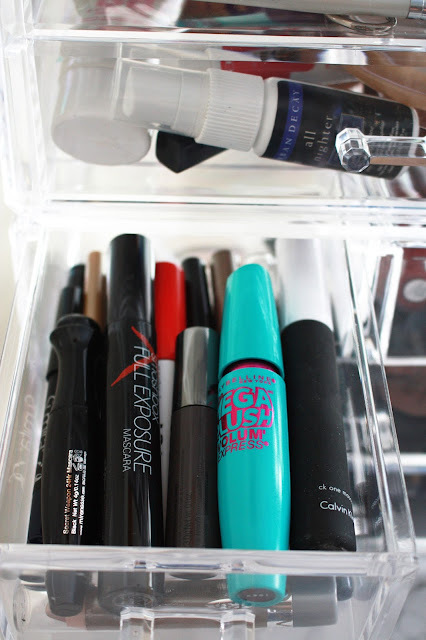 This is the largest drawer and the one filled with the most products. 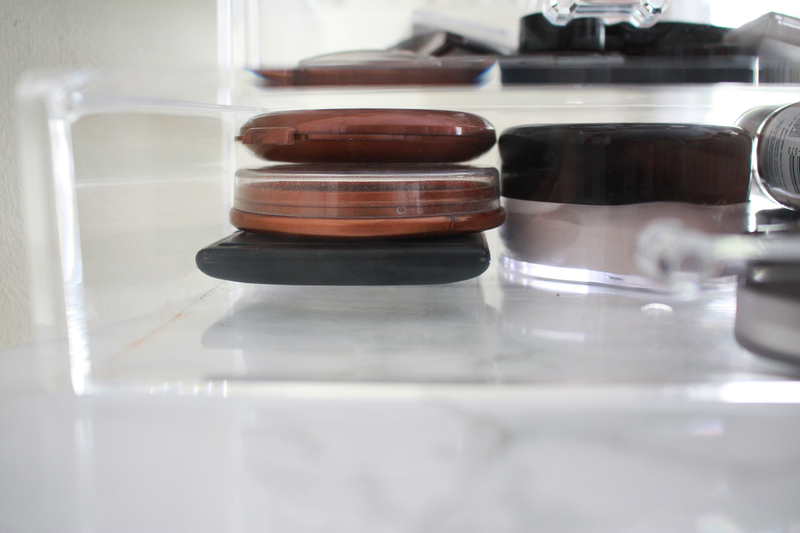 As you can see I can fit three compacts or one large powder container in the large drawer. Or I can fit one compact and one foundation bottle. What I love about this particular set is that the drawers are super deep. Each drawer is 2" deep. Some of the drawers I looked at were only an inch deep and wouldn't be able to hold some of my foundation bottles. 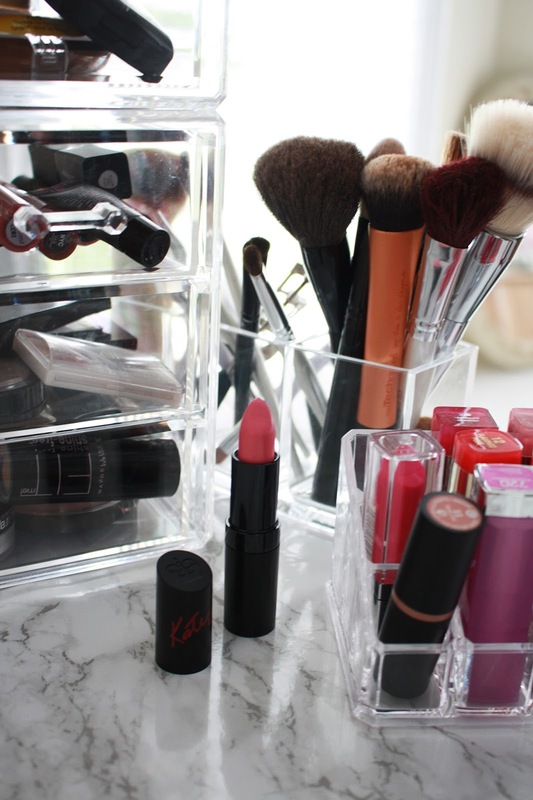 The first set of drawers holds my everyday makeup. All the products that I use on a daily basis. The second set houses all my 'extra' makeup that I don't use daily. Then I have a three compartment acrylic 'pencil' cup that I use for all my extra brushes. 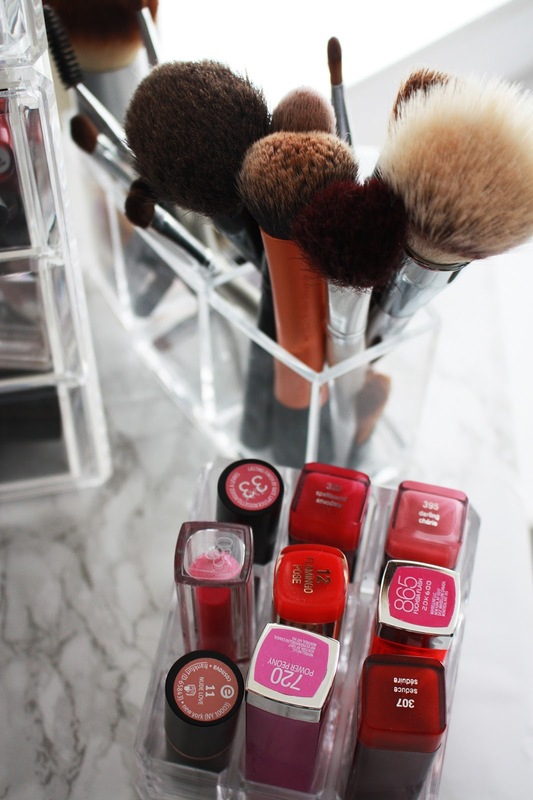 I also have an acrylic lipstick holder that houses all my most used/in season lipsticks. Oh and the marble countertop is actually a vinyl contact paper that you just stick on! The exact one I have is out of stock on Amazon but here's a super similar one. I did manage to find the exact set of drawers but they are on the pricier side. :/ If you have an At Home store near you definitely go there to get the drawers! Or try HomeGoods! I've seen acrylic drawers there before! So that's how I organize/store my makeup! I'm so happy that I found these drawers and absolutely love the way it looks! It's both functional and stylish! "i have too much makeup. said no woman ever"
Love the way the acrylic draws look, I just keep all my makeup out on my vanity but it's getting a bit cluttered so I might have to invest in one of these too! 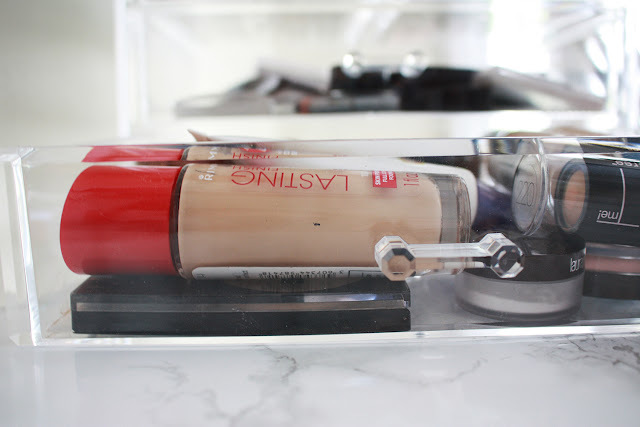 I had an acrylic table top makeup holder but it was too small. I had some makeup in that and some in just a decorative dish. These beauties changed the makeup storage/organization game! I love them!